When I think about A Star is Born, I get shivers. I first heard about this film while dancing away in a crowd at Glastonbury festival. The crew announced a ‘surprise guest’ was coming onstage for a brief 10 minutes. It was Bradley Cooper. He was actually singing. (You’ll recognise the scene – just look out for all the flags). And this was the brilliant thing about it. Cooper and Lady Gaga sang their songs live. 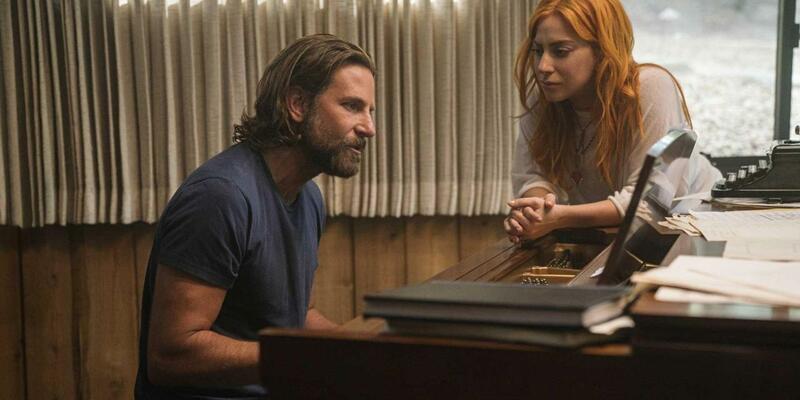 Cooper, as his character Jackson Maine, looked like a dusty, semi-broken man throughout and Gaga looked nothing less than the blossoming popstar she was portraying. I couldn’t work out what my favourite bit was; Gaga’s unassuming yet badass character, Ally? Cooper’s withered, tanned skin perhaps? The songs themselves? Or the chemistry between our two leading actors. It felt authentic in every single way. Gaga was the perfect choice for this role. It’s so nice to see her beneath the crazy makeup and costumes. The film feels very meta for this reason. Gaga plays a singer who gains superstar status. She goes from girl next door to hair-dyed, I‘ve-got-a-manager success. Much like, I imagine, what happened to her in real life. In a way, it can make you feel disillusioned; the implication that to be successful, you’ve got to slap a bit more face paint on and market yourself better. That talent won’t always cut it. That you need to be in the right place at the right time, with a famous boyfriend. But what’s brilliant about her character, Ally, and the way she plays it is the fact she never questions this process. So in turn, you never question it. After meeting the well-known Jackson Maine, Ally is thrust into the spotlight where she can finally showcase her talents. Her life rockets from waitressing to the Grammys. This transformation isn’t really the focus of the film. And thank goodness. Because the movie avoids becoming too Hollywood cliché. It’s more about Ally’s quiet confidence and hers and Cooper’s on-screen chemistry. It’s also a look at building a life together and navigating the dynamics of a relationship when your world is shifting. It’s a reflection of living in the public eye and the sacrifices you have to make on a personal level. And you really take so much more from it this way. A firm reminder that no matter how grand someone appears to be or successful they become – we’re still human. We all have our flaws and struggles. I’m so glad the story doesn’t apologise for Ally’s mainstream success. In the face of her edgier country-loving boyfriend, the content of her pop songs meant that the movie could have spiralled into a narrative about questioning success and whether it’s true success. But the film avoids this pitfall. Leaving us to accept that achievement is whatever you make of it. If you back yourself enough, everyone else will just fall in line. And don’t even get me started with the musical numbers and close up shots of them singing. Gaga looked like she was going to throw her guts up each time. You could literally see her heart and soul pouring into the words she belts out. It’s powerful and moving. I wish I’d been a popstar.